Zoe, tell us why FQ decided to launch the Composer Development Program? We had so many scores building up in a pile from composers wanting to have their music heard. We knew that we were probably missing out on some real gems but didn't quite know where to start, so we decided to start afresh and have a regular call out for submissions. Matt, how long have you been composing and what lead you to apply for the 2017 Composer Development Program with Flinders Quartet? I dabbled in composition in my uni days, but since the end of my studies in 2013 I’ve put most of my energy into establishing a career as a freelancing viola player. When I saw the Flinders Quartet had their workshop it just put in my head the idea of turning some little ideas I had into a quartet, and having a deadline sort of made it happen. I was quite surprised when they decided to take it on! Zoe, what was it about the work that Matt submitted to your Composer Development Program, that drew you all in? Matt’s quartet “Shapes” was obviously complex, but somehow the story and narrative of the music was evident. I was the first one to look through the score and it really caught my attention with its musical ideas. It did look very tricky though. We happened to be on tour while I was selecting the works and before I suggested it for inclusion, I showed it to our violinist Nick Waters and we both agreed that if we didn't include it, it would be a real shame. After all, if we didn't give it a go, who would? The submission process for the Composer Development Program is anonymous – why is this important to FQ? It removes any suggestion of even a subconscious reaction to a composer's age, gender, experience or background and forus, that's really important. There is no agenda other than trying to discover the best music we can. Matt, how did you find the experience during the program and what were the highlights and challenges for you? The experience was great. I’ve sat in quartets before and played new work but it’s very different from the other side. So to hear my piece “Shapes” evolve and come together was really interesting. When you play I guess you take every detail equally, but when you’ve written something you know what’s important and what isn’t so much, so that was also enlightening and made me consider every detail more thoroughly. It was a really difficult piece but I learnt a lot about the sorts of things that will evolve naturally, the sorts of things that you need to say something about, that some things you expect to be easy may not be in context, and visa versa. So I guess rehearsing a work with an established group, it’s a process of letting go and being pragmatic; letting the work change and seeing if it can be made better. Zoe, what is your favourite part of the Composer Development Program? Personally, I love that tension of the first presentation to a composer and being part of bringing a piece of art to life. Sometimes there's an immediate response from the composer (either positive or negative) but it's the gradual sifting out of what makes up the essence of a piece of music that I love. It's like meeting a new person in a way. Also, we all love the recording process, but I guess the one element of what we do that I love the most is performing. The energy live new music creates is really special. Matt, you were awarded the residency at “All That We Are” in Tasmania, which was made possible through Scarlet’s Fund. Can you tell us about this experience and how this influenced your composing? This was the first time I’d ever had to actually just write and it took a bit of adjusting! I learnt how critical environmental factors are to writing, and how to build a routine that works best for me, which I still use now so it was incredibly useful. The location of the residency is so ideal for writing, with a lot of open space and places to walk. I also got over to MONA (the Museum of Old and New Art), and All That We Are hosts Victoria and Simon are so accommodating, they make you feel at home! Zoe, after the 2017 Composer Development Program, FQ decided to commission Matt to write a new work. What made you decide on this commission? The piece that Matt submitted to our Composer Development Program, entitled “Shapes”, was one of the hardest works we've performed in recent years. We were curious about the next steps in his compositional output and knew there was only one way to find out! To be commissioned to write this work without any boundaries on subject matter or time frame was really wonderful, but also very daunting. I’ve learnt limitations can really be your friend! But it meant that I had the time within the work to say something substantial. I started with a few ideas for some of the sounds I wanted to go for and used some ideas from a few years back. I then gave titles to the various movements and from there I had a framework to write the piece. Would you recommend the Composer Development Program to other composers and why? I’d really recommend applying! The quartet are really committed to performing your work to a really high standard,working with you to realise the score as best they can and helping you to improve it regardless of style or aesthetic. You get a great performance and recording at the end of it too, which I’ve found really useful for other things I’ve applied for. What's the next step for you in your composing career and what are you working on at the moment? At the moment I’m working on a piece for Ossicle Duo - it’s for trombone, percussion and electronics. Having not written for any of these instruments before, it’s an interesting challenge! There are other projects coming up that I can’t announce just yet; but I can honestly say the journey I’m on now started with the Flinders Quartet Composer Development Program, so I’ll always be very grateful! Matt Laing was a participant in FQ’s 2017 Composer Development Program. FQ commissioned Laing to composer “Out of Hibernation”, which was premiered February 2019. 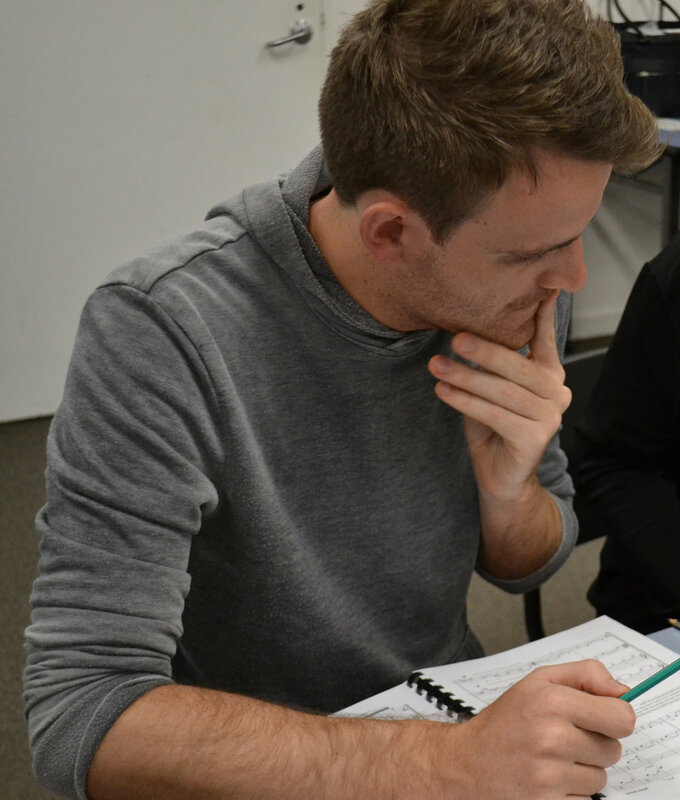 Submissions for FQ’s 2019 Composer Development Program close 5 April 2019, 5pm AEDT. Click here for details.